We’re excited to announce that Google Cloud Platform (GCP) Role-Based Support and Enterprise Support are now fully launched. These are designed to fit the needs of all our customers, for workloads along the spectrum from development to business-critical. Our support offerings reflect the relationships that we have with our customers, and our belief that when you are running workloads on GCP, we are your allies with shared outcomes and successes. Our engineers work directly with your engineers to solve deeply technical scenarios, and are always looking to offer proactive solutions. With this in mind, here are the details of these new support models. We designed Role-Based Support as an a la carte service, so you don’t get bogged down with support costs that don’t match your cloud computing needs. 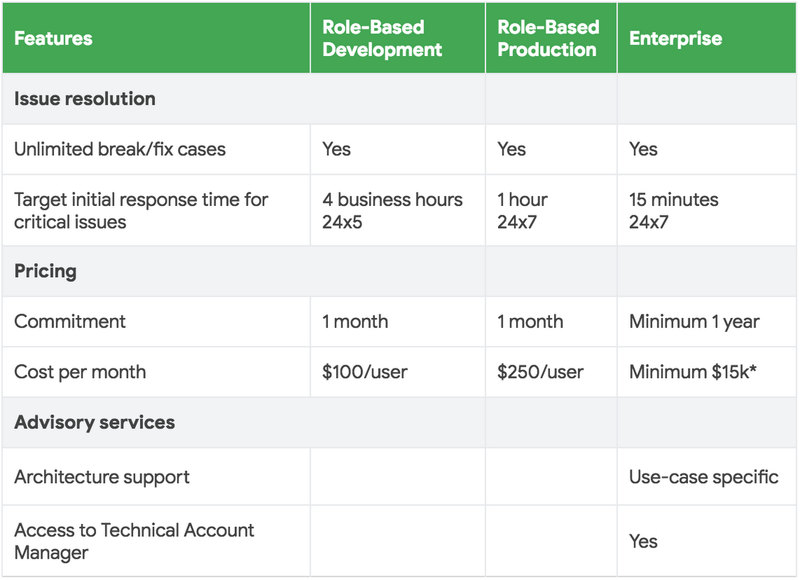 When you’re using Role-Based Support, you may choose from three support roles on a per-user basis: Basic, Development or Production. Support account administrators can assign users to roles according to organizational needs. You decide how many of each role matches your unique needs. It's a simple and flexible cost model, with month-to-month commitments and flat rates per user, per month for predictable cost management. When it comes to issues that require a fast response, your production teams get the response they need within one hour. For teams working in development, pushing the boundaries of innovation and trying new things, you may not need a response as quickly. So the response time is a bit longer—four hours—and the price reflects that. We’ve heard from customers that this type of support helps them get the right help at the right time, at a manageable cost. This support level is right if you have business-critical systems in the cloud and need mission-critical support. We combine a technical support expert with a longer-term commitment and percentage-of-spend pricing model. This level brings you a full set of services, and over time, your enterprise business can benefit greatly. Our support teams, partners and engineers work with you to implement the right cloud architecture for your business, then help as needed as that architecture evolves. Enterprise Support helps you maximize business value from your GCP solution and minimize risk. You get a 15-minute response time, 24/7/365 for your most urgent needs, as well as a dedicated Technical Account Manager (TAM), a proactive advisor who learns your business requirements and provides a roadmap for success. TAMs bring deep product knowledge and an understanding of cloud adoption best practices. Your TAM learns about your business in detail and uses regular checkpoints to monitor success metrics and keep you on track as you grow your business with Google Cloud. TAM relationships have helped power many growing enterprises, and they are essential to creating positive shared outcomes. Google Cloud Platform support helps you navigate the complexity of today’s cloud environment to get the most out of your investment. Learn more about choosing and using GCP support. And you can sign up now for Role-Based Support or Enterprise Support.